In people, the sacrum is an expansive, triangular bone at the base of the spine and at the upper, back piece of the pelvic depression, where it is embedded like a wedge between the two hip bones. Its upper part join with the last lumbar vertebra, and its lower part with the coccyx (tailbone). Typically, it starts as five unfused vertebrae which start to breaker between the ages of 16–18 years and have normally totally combined into a solitary bone by the age of 34 years. 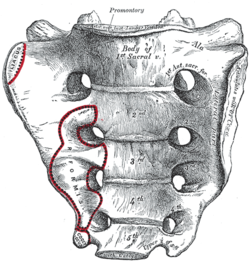 The sacrum has three separate surfaces which are formed to suit different structures. It explains with four different bones. It is bended upon itself and put sideways (tilted forward). It is inward, confronting forward. The base activities forward as the sacral projection inside, which is the superiormost bit of the sacrum. The focal part is bended outward at the back, permitting more noteworthy space for the pelvic pit. The two parallel projections of the sacrum are known as the alae (wings), and eloquent with the ilium at the L-molded sacroiliac joints. The sacral vertebrae create before the end of the first month of embryonic advancement, the higher vertebrae having created first. There are inborn issue that create in the early phases of fetus. Sacred means valued due to involvement with holiness. Holiness, or sanctity, is generally the state of being holy or sacred. In other situations, “objects are frequently considered ‘holy’ or ‘sacred’ if used for spiritual purposes", such as the worship or service of gods. These terms can also be employed in a non-religious or semi-religious context. It is often credited to people (“a holy man” of spiritual occupation, “holy prophet” who is respected by his followers), objects (“sacred object” that is venerated and blessed), times (“holy days” of spiritual introspection, such as in winter holidays), or places (“sacred ground”, “holy place”). In vertebrate anatomy the sacrum (plural: sacrums or sacra) is a large, triangular bone at the base of the spine and at the upper and back part of the pelvic cavity, where it is inserted like a wedge between the two hip bones. Its upper part connects with the last lumbar vertebra, and bottom part with the coccyx (tailbone). It consists of usually five initially unfused vertebrae which begin to fuse between ages 16–18 and are usually completely fused into a single bone by age 34. It is curved upon itself and placed obliquely (that is, tilted forward). It is kyphotic — that is, concave facing forwards. The base projects forward as the sacral promontory internally, and articulates with the last lumbar vertebra to form the prominent sacrovertebral angle. The central part is curved outward towards the posterior, allowing greater room for the pelvic cavity. The two lateral projections of the sacrum are called ala (wings), and articulate with the ilium at the L-shaped sacroiliac joints. I walk the many mile. And it get hard. Up and down and up and down I go. I hitching lifting with car - I cheating. I only manage 12 mile on feet and landing in centre of famous town near borders to other state. I now go the south way. You still not know where I going too?